The environmental reports of 12 Scottish Strategic Environmental Assessments have been subject to critical analysis in order to assess the extent to which they include Cumulative Effects Assessment (CEA) as a required component under the SEA directive. 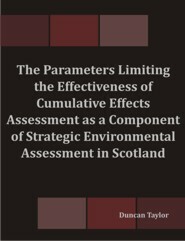 The anticipated benefits of assessing Cumulative Effects in a strategic setting are wide-ranging and well researched, yet there appears little documented evidence of this in the Scottish context. The level of Cumulative Effects inclusion in the reports studied was investigated, along with the parameters that appear to limit the success of the lauded relationship between these environmental assessment tools. An 8 criteria review-based methodology was constructed, based on a best-practice framework from the extensive literature synthesis provided, and it served to evaluate Cumulative Effects inclusion throughout the assessment process. In addition, the authors of 5 of the 12 Environmental Reports were interviewed to gauge understanding on the phenomenon of Cumulative Effects, Cumulative Effects Assessment, and how it is best integrated into SEA. The results of these interviews were then subject to thematic analysis, and compared to the findings of the review criteria. The findings of this research suggested CEA is a low priority in Scottish SEA practice. CEA was found to be carried out in an irregular and sometimes reluctant fashion. In particular, the Environmental Reports under scrutiny showed only limited CEs considerations and methodologies. In interview, practitioners provided largely inadequate definitions of Cumulative Effects and showed limited conceptual understandings of Cumulative Effects Assessment. Overall, CEA appears undervalued as an assessment tool in arguably its most appropriate context.